You take it home, only to discover your little fish floating belly up a few days later. Or, maybe this isn’t your first fish funeral. Time and time again, you find your fish dead – It’s like you have become a fish serial killer. To a beginner, it could look like your fish died for no reason whatsoever. While it is possible that the fish you bought was unhealthy and already destined for fish heaven – it’s much more likely that your fish’s death is because of something you did or didn’t do. So today, I am going to unravel the mystery of why your pet fish died! It isn’t good for humans, and it definitely isn’t good for fish. An overly stressed fish will eventually die. It’s just a matter of time. It may take a few days or weeks – but one thing is certain, your fish’s days are numbered. Unfortunately, stress makes it difficult for a beginner to determine why their fish died. Imagine that you come home, only to discover that every fish in your tank is dead. You would probably think back to what you did that day. I mean, your fish were fine yesterday, so the cause of death must have happened today, right? Well, the cause of your fish’s death might have happened weeks ago, and your fish have tried their best to survive this entire time, before finally losing the fight. You see, stress is not an instant killer. It’s more like a time bomb. And because fish don’t show emotion or expression, a beginner may not even know that their fish is on death’s door until it finally passes away. So, let’s take a look at the common causes of stress that can lead to the untimely death of your pet fish. 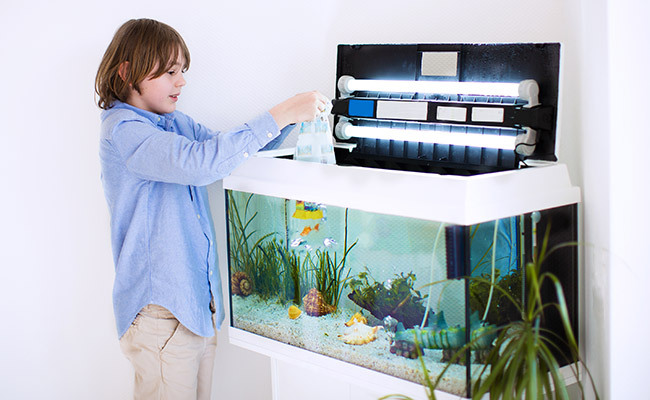 Setting up an aquarium is easy – grab a glass tank, fill it with water, add your dechlorinator. Now, all that’s left is to add your fish, right? Believe it or not, you might not be able to add fish to your new aquarium for a few weeks. I mean, you can, but there is a high risk that they will die soon. The first thing you want to do is cycle your aquarium. You see, fish are not the only things that live in your aquarium. A healthy tank also has bacteria that break down and remove waste from your aquarium. To put it simply, this bacteria keeps the water safe for your fish. Just one problem – this bacteria does not exist in a new aquarium. If you add your fish now, your fish can become stressed and die. So, what you want to do is introduce this bacteria into your aquarium – ideally before you buy your fish. The process of establishing this good bacteria is referred to as cycling your aquarium. Ideally, cycling your aquarium should be done before you buy your fish because the process can take a couple of weeks. FishLab’s Fishless Cycling Guide will walk you through the steps to make your aquarium safe for your fish. If it’s too late and you already bought fish, then you can try a fish-in cycle. Check out our Fish-in Cycle Guide to give your fish the best chance of surviving. Note: Fish-in cycling is incredibly stressful for fish, and it’s likely that your fish will die in the process. I highly recommend cycling your new aquarium before buying fish. Your tank should be set up to suit the fish that you keep. A saltwater fish will die in a freshwater aquarium. Similarly, a fish that prefers warm water will likely die in cold water. But just because your fish isn’t dead yet doesn’t mean that your setup is right. 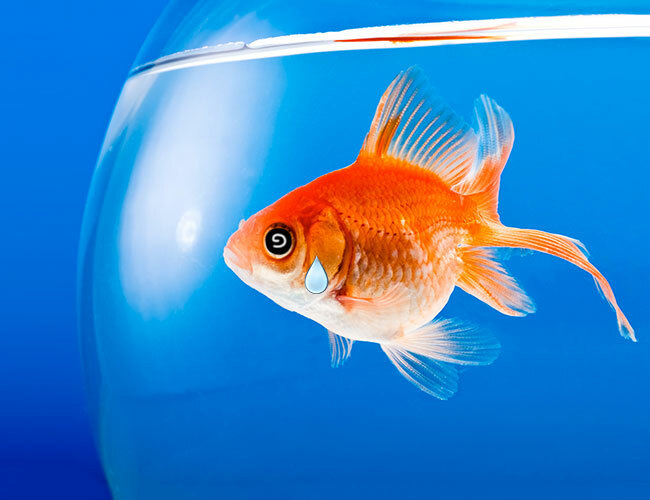 In fact, while your fish appears to be surviving, it may be stressed beyond belief. And as we discussed earlier, stress can lead to an early death. Take betta fish for instance. They prefer calm water, so strong water movement, say from a filter nozzle or bubbler, can stress a betta out. A pleco, on the other hand, needs plenty of places to hide. Without a safe spot to hole up, plecos can become stressed. Meanwhile, African cichlids need hard alkaline water, the exact opposite of cardinal tetras, who thrive in soft, acidic water. Failing to provide an appropriate environment for your fish can lead to it dying well before its time. Because no two fish are alike, read up on the preferences of your fish before introduction to your tank. Where one fish may thrive, another fish may become stressed and eventually die. Too many fish in your aquarium? An overcrowded tank is essentially a death sentence for your fish for numerous reasons. First, you know that good bacteria I talked about in the previous section – the one that breaks down waste to keep the water healthy? Well, it can only break down so much at a time. Generally speaking, the larger the tank (and filter), the more good bacteria there will be to break down waste. 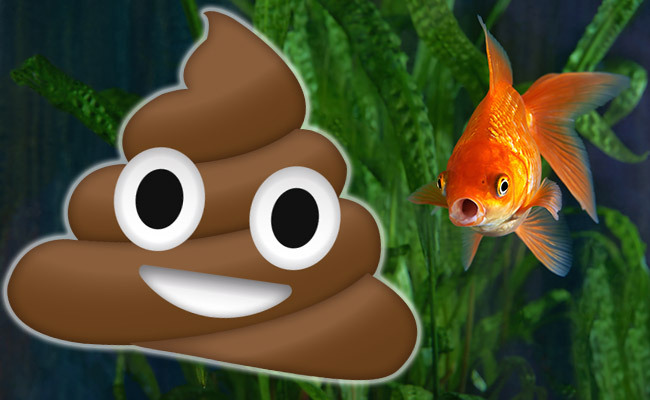 So, the more fish you add to your aquarium, the more poop. If your fish are pooping at a faster rate than the good bacteria can break it down, then your water can soon turn toxic – killing all your fish in the process. For beginners, this is most commonly seen when betta or goldfish are kept in an aquarium that is too small, but it can happen in an aquarium of any size. But it’s not just overcrowding that is the issue. A small tank, without much room to move, can cause a fish to become stressed, leading to an early death. Like you and me, fish need oxygen to breathe – without it, they will soon die. The problem is that there is only so much oxygen in your aquarium. And if you have too many fish, then they will be breathing faster than the oxygen can be replaced, causing them to suffocate. And remember, fish grow. Just because your fish is small now doesn’t mean it will stay that way forever. 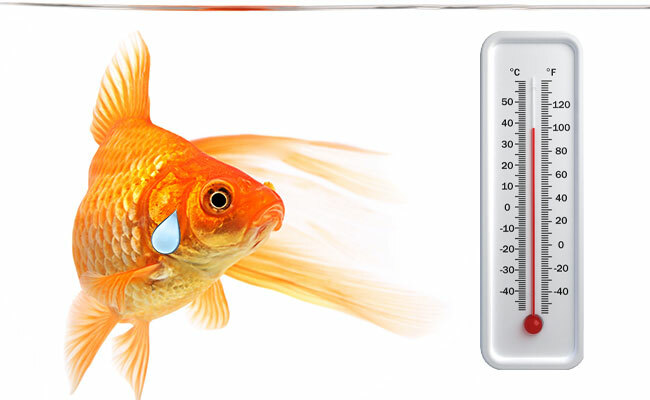 Your goldfish might be less than 2 inches now, but it can grow to a whopping 10 inches! Not all fish get along. While you may have the best intentions, you may have accidentally created an underwater cage fight instead of a peaceful home for your fish. Some fish that are commonly owned by beginners are downright aggressive – fish such as cichlids, Chinese algae eaters, blue gourami and male betta can be territorial, fight over food and even attack or bully other fish. In the wild, your fish would be able to easily escape its bully. Unfortunately, your aquarium is much smaller, and your fish has no other choice but to flee for its life, day and night. Being constantly chased and nipped at by a territorial fish is stressful and will likely lead to your fish dying sooner than it should. 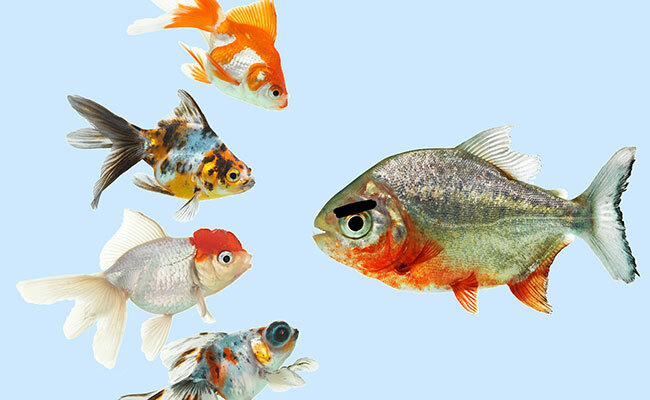 Before you purchase any new fish for your aquarium, ask about their compatibility with the other fish in your aquarium. Another extremely common form of death is overfeeding. It always surprises a beginner just how little food fish actually eat. 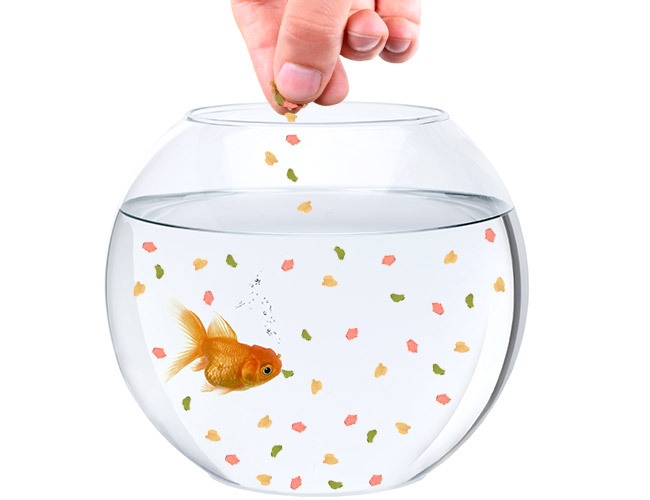 Take a single betta for instance – you know those micro-pellets they eat? Well, your betta only needs three to keep full. Any more than this and you are overfeeding. But the reason overfeeding is bad for your fish is because it causes the water to become dangerous. To put it simply, whatever goes into your fish must come out. The more you feed your fish, the more they poop. Also, uneaten food decays, creating more waste. This waste quickly fouls up your water and before long, becomes toxic, killing your fish. Also, you want to make sure that you are feeding your fish the right food. A meat eater isn’t going to live long eating fish food made from vegetables. You should be setting time aside every week or two to clean your aquarium. This typically includes wiping down the glass, cleaning the substrate and checking to ensure everything is in working order. But perhaps the most important maintenance is performing a water change. You and me? We have the luxury of keeping our home clean by throwing out the trash and flushing the toilet. Your fish on the other hand, must swim in it. If waste continues to build up and you do nothing about it, your fish are at risk of dying. It is for this reason that you should perform a weekly water change. By removing 10-20% of the gunked up water in your tank each week and replacing it with fresh water, you’ll keep your fish happy and healthy. Rapid swings in water temperature, pH or salinity can shock a fish, which soon leads to death. It is for this reason that you should acclimate any fish that you bring home before adding them to your aquarium. There can be a large difference between the water in the bag and the water in your aquarium. Likewise, if you are performing a large water change in your aquarium, the temperature of the water being added should not be too different from that of your aquarium. Any changes that you make to your aquarium water should be slow and steady. As I touched on earlier, after you cycle your tank, you will have good bacteria living in your aquarium. And, this bacteria breaks down waste that would otherwise make your fish sick and ultimately die. For the most part, this beneficial bacteria lives in your filter and substrate. If this bacteria dies, then the water in your aquarium will soon turn toxic, killing your fish. How does this bacteria die? It’s often by mistake. If you forget to add a dechlorinator during a water change, then you will wipe out the entire bacteria colony – chlorine is a bacteria killer (and a fish killer too!). Similarly, if you rinse your filter with tap water, the chlorine will do the same. Another way is when replacing your filter or filter media. Your new filter will not contain any beneficial bacteria, which will lead to waste quickly accumulating to lethal levels. Can you imagine walking outside when all of a sudden someone abducts you and sticks you in a tiny cell? Actually, it sounds like a scene straight out of a horror story! But it’s not much different than the journey many fish destined for aquariums make. If your fish is wild-caught, then it made a journey halfway across the world just to end up in a small tank in your local fish store. It is possible that the fish you buy are already stressed from this long journey. Similarly, the last leg from the fish store to your home can be a killer. 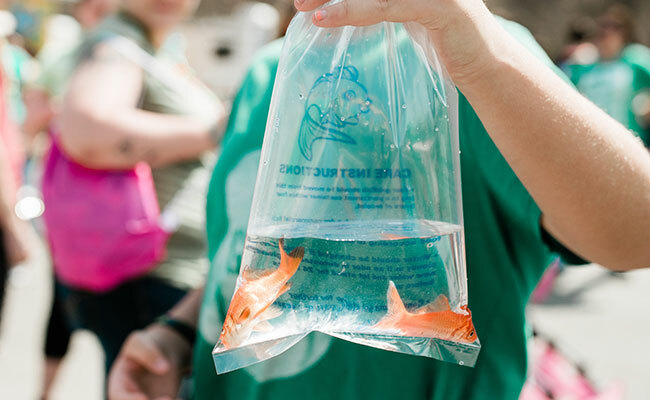 That plastic bag you bring your fish home? Well, it only has so much oxygen in it. Also, too much shaking of the bag is definitely going to stress your fish. Research shows that humans are more likely to catch a cold when under stress. Well, studies show that the same goes for fish. You see, a healthy, stress-free fish has a strong immune system – their skin, scales and slime coat are more than capable of fending off any disease or parasite. A stressed fish, on the other hand, is more prone to illness and disease, which can ultimately end in the death of your pet. Keeping your fish stress-free goes a long way toward keeping your fish alive. Finally, you have old age. I’ll be honest, for a beginner wondering why their fish died, this is perhaps the least likely answer. However, if your fish has had a previous owner, then it is plausible that your fish passing may simply be due to leading a full life. After all, no fish is going to live forever, and one day your lively little fish is going to give up the ghost. 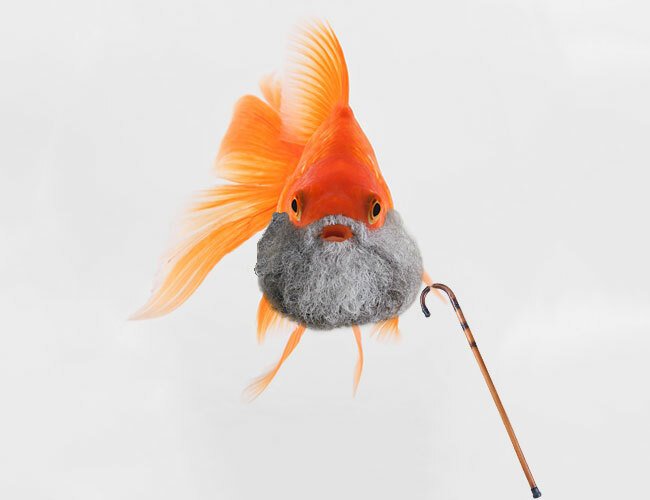 Yep, no matter how well you care for your fish… There is no escaping old age. Just how long before your fish passes entirely depends on the breed. 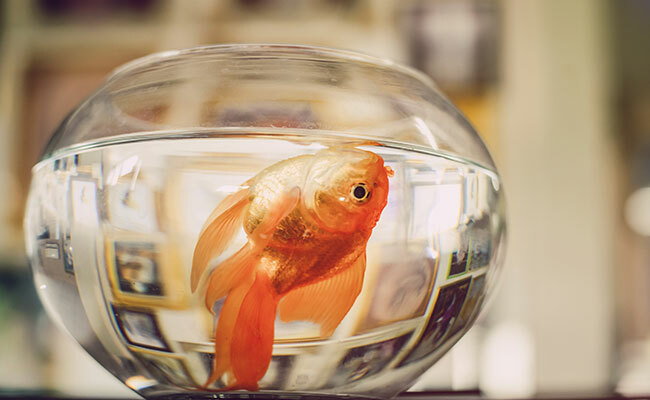 For bettas, 4 years is considered old, while a healthy goldfish can live for 10. I’ll be honest – in my 30 years of fishkeeping, most instances of fish dying can be put down to the owner making a mistake or just not knowing any better. Look, accidents happen. And, there is nothing to be ashamed of. If you made an error that lead to your fish dying, don’t beat yourself up over it. Instead, use it as a learning experience. You can now provide your next fish with a full and happy life! Can you think of any other reasons why a fish might die? Let me know In the comments below! Nice love it. I love all your tips will be greate for the new Betta fish I’m getting. Thanks so you much you really helped me out. I have a 10 gallon tank with 2 pepper Cory catfish and 4 red wagtail platies. My platies are just hanging out at the bottom of the tank hiding behind decorations and within the first few hours of having them my Corys started hanging out at the top side up like they were dead but they swim around and act active occasionally. I highly recommend researching how many fish you can fit in a 10 gallon (it’s less than you think.) Your tank is too small for the amount and type of fish you have and is a recipe for disaster. I have a 25ltr tank and my new filter can go in a tank up to 300ltr is this to big for my goldfish. My 5 yr old goldfish died 6 days after putting new filter in and since I have bought 3 new ones and all died within a week. If you replaced the filter, you likely crashed the cycle in your tank. If this is the case, you should cycle your aquarium before attempting to add any more fish. Also, a 6 gallon tank is too small for goldfish, so that likely wouldn’t help either. I have a 78 gallon tank with a mix of koi, goldfish and one minnow. The goldfish and the koi seem to get along nicely with the minnow…so you can mix minnows with such large koi. My largest koi Sunflower, is about 7.5 inches long! While Daisy is about 6.5 inches long! And also, my favorite goldfish is Finch! Ive had had him for about 3 and a half years now and he just lost a scale, i can tell because there is a white spot where the scale had been. My aunt has an aquarium and has fish dying. She recently had radiation for cancer and had to stick her hand in the aquarium. Is this what is killing her fish? I’d be doubtful that this is the reason her fish are dying. It’s far more likely to be something else on this list. Help please, I just got a 20 gal tank tetra tank with a filter and water temperature. I set up the water stone for aeration. And for only 5 days; 2 fish died(goldfish) one instantly. The second unknown. Later on, I noticed the tank water was getting cloudy and I did a hefty(50%) water change, cleaned the gravel, cleaned the tank walls, and added 2 ph tablets in case there were ph issues. They’ve now all day(11 fishes total; some goldfish, some scavengers and some other cool looking fishes; sorry I don’t really know the names). They never fought/bullied one another and I noticed they gasped for air a lot. But I’m sure that wasn’t the only issue. Please help if you can so I don’t have to accidentally let this process happen again. Incredibly devastated. Likely stocking issues and that you didn’t cycle your aquarium. I’d read up on these two issues, as you are going to lose a lot more fish if you don’t understand these processes. When you say full clean, does this include the filter media? If so, you might need to re-cycle your tank. Grab a test kit to make sure. Looking for some advice, as I’ve had 3 mollies die in recent weeks, 2 of which are a bit of a mystery, and the third died of dropsy. I started my tank (120l/30gal) at the end of January and began a fishless cycle using ammonia. I then tested the water every day until the nitrite and nitrate began to register. I allowed the ammonia and nitrite to return to zero, then added some fish. There was an initial spike from adding the fish but this quickly settled. I initially added 6 small mollies to the tank, which were all living peacefully. These were allowed to settle in the tank for 2 weeks, then I added a Betta and 3 panda corys. Everything seemed to be going well, until I came to check on the tank one morning and one of the mollies had died suddenly. Within a few days, another developed dropsy and also died suddenly. I performed a water change (40l) with mostly RO water, as the water we have is quite hard (off the scale on an api GH & KH test). I always use a dechlorinator with each water change. It was also recommended that I use some aquarium salt to help lower the hardness and add some benefit for the fish. I have been doing a water change of the same size every 2 weeks. I performed a full water test yesterday, both ammonia and nitrite are zero, and the nitrate is around 20ppm, KH and GH of around 200ppm, with a ph of around 8.2. From what I can tell (despite a slightly higher pH than ideal) the water quality is good. All other tank members look great, are acting normally, and feeding well (I feed a pinch of fluval bug bites food once a day, and fed them some frozen brine shrimp instead more recently) and there is never any leftovers. I monitor my parameters closely, so have a decent data trend with nothing out of the usual showing from my figures, and I’m beginning to worry that something has gone awry that I have missed. I’d appreciate any advice you can give! Unfortunately, it’s really hard for me to diagnose fish deaths, and it’s outside of the scope of this article. 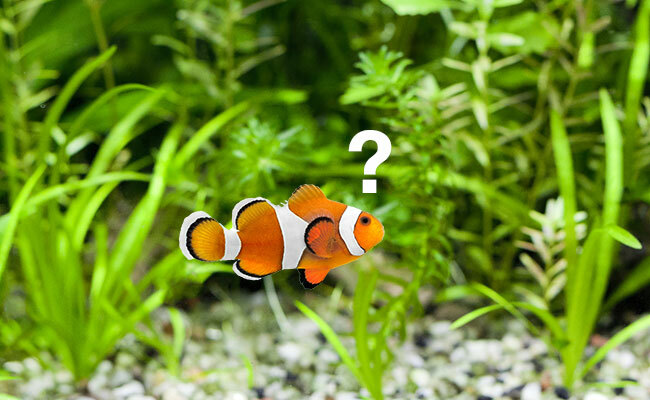 I would suggest joining an aquarium forum like fishlore, local aquarium club or discussing with your local fish store, who may be able to shed light on the matter. Here is the thing, it might not even be anything you have done. If all three mollies were purchased at the same time, it IS possible they were already stressed or sick due to handling or conditions prior to being purchased. Often, fish don’t show emotions or obvious clues that they are sick or stressed, and it unfortunately might have finally caught up to them a month or so later. This isn’t usual, despite you giving the best life possible. I mean, sure your pH is a little high, but if you acclimated your fish and it has remained constant rather then fluctuating, then I don’t see it being of huge concern. If you are confident you haven’t done anything to cause the deaths, and your other fish are fine, then I would try buying another three from a different source. Help! I have a new aquarium , marineland 38 gallon bowfront with penquin 200 biowheel filter. I set up the tank, conditioned the water, added bacteria, let the aquarium “do it’s thing’ ( I thought) and purchased my first 4 tiny fish, 3 skirtfin tetras and a dwarf gourami. Within 4 hours the tetra were dead. The next day the water got quite cloudy, so I figured I’d pushed things too quickly and the cycling hadn’t occurred, so I waited til the water cleared (it’s Crystal now) and tested the water before buying new fish. Again , within 6 hours 3 healthy, active skirt tails are dead. It occurred to me as I watched them that they were struggling with the current created by the filter. I’ve noticed that the gourami , who has survived through it all, tends to hang out on the far side of the tank behind a large plant. I though it was a territory he’d established, but maybe a respite is more likely? Could the flow be what is stressing these ti fish? If so, what to do about that? My water parameters are 0’s for ammonia, nitrite and nitrate, as well as 0 for chlorine and chloramine, pH 7.2, alkalinity 80, hardness 75, temperature 78. If you are measuring zero for nitrate, then it’s a sign that your tank isn’t cycled. Nitrate is continuously going up in a cycled tank and a zero is a sign that something is amiss. As for the current, fish like betta and gourami live in slow moving water and can indeed be stressed by faster moving currents which can lead to death. However given the speed at which your fish died, I am doubtful this is the cause. What if none of the forementioned apply? We have a 10 gal aquarium. We had 8 koi/goldfish, not positive which. We would lose one a month on average and about to lose the last one. I changed the water (about 20%) and cleaned the tank once a week, and would add one gal if the water got low between. I made sure the new water sat for 24 hrs to become the same temp as the water in the tank. I fed them once a day, i use prime as a declorinator. The fish would start almost laying in the bottom of the tank, and kinda bend in the middle upon death. We cycled the tank before adding fish, started with 4, and added a couple more here and there up to 10. Reason 3: Overcrowding applies here. Your example is the very definition. If you have 8 goldfish in a 10 gallon your tank is overstocked. If you have 8 koi in 10 gallon, then even more so. I’m not surprised you are losing fish. You can’t keep adding fish and hope for the best, the “one inch per gallon” rule is a myth. Use a site like Aqavisor can help to an extent with determining stocking capacity, but the best way is to speak to someone at an independent fish store or fish club, who has experience with the fish you plan to keep. How long will it takes to kill the good bacteria in aquarium during cleaning? I don’t really understand your question. If you are talking about cleaning with chlorinated water, then near instantly. How would I know if I have enough O2 in my water? It’s a 75 gallon tank with 8 fish in it. Fresh water. The only aeration is coming from the over the back filter. Unless your fish are swimming to the top of your tank, gasping for air or your tank is overstocked, O2 is the least likely cause of death in a tank – if you are providing surface agitation with an appropriately sized filter, this is typically enough. If you are extra concerned, there are O2 tests available, but in most instances, I wouldn’t even bother. I have a fish tank of 240 gallons (community tank consist of Platies, Mollies & Angel fish) yesterday everything was fine but at night I noticed few of platies and mollies came to top corner side I thought it’s normal and early morning all of them died (50+) only two angels survived. What can be the reason for it and earlier few days they looks all fine even some platies give birth too. I am very stressed and sad now. Please explain what can be the reason for it ? Have you tested your water parameters with a test kit? If you have, and everything looks good, then it’s possible a lack of oxygen. Fish often swim to the surface (excluding labyrinth fish, like betta) when they are struggling to breath. 4 days generally isn’t long enough to cycle your tank. You should be testing the water quality yourself with a test kit, to confirm what they are saying is correct. Check out my fishless cycle guide for more information. Did you cycle your tank? Many problems can be traced back to water parameters. Please refer to Section 1 in the article. See point 1 in the article. It’s likely you didn’t cycle your tank. Hi there! I just bought a betta fish and I’ve noticed that he won’t eat and is extremely sluggish, just mainly floating around his tank. I looked up what could be wrong and it seems like swim blatters disease. Do you think thats true and do you have any suggestions on how to save him? Did you cycle your tank? If not, it’s likely a build up of ammonia and nitrite. Read this a lot of beginners miss this step because the pet store doesn’t tell them about it. 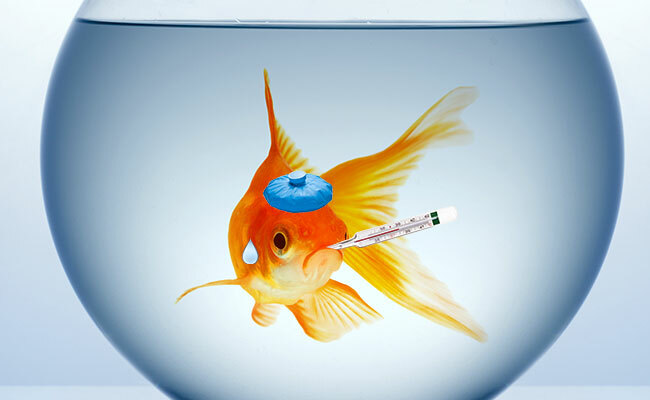 You’ll need an aquarium test kit to determine what has gone wrong. I use this one. I am having trouble with my betta. His nose is on the bottom of the 10 gallon aquarium and his body is free floating vertically above this. It is a new aquarium to me, but i bought it 2nd hand and on the trip home, had to replace about 3/4 of the water because of the weight of the tank to carry. i replaced the water once home but replacing probably 2 gallons at a time, and by putting in conditioner. all 5 fish were fine, it has been a week now, but 3 days after i got the aquarium the betta was laying on the bottom of the tank, and he has been nose down for 3 days now. i have put in stress coat and water clarifier and i did not change the filter. i believe he will die very soon as this is day six since he has been unwell. any suggestions? First step is always to grab an aquarium test kit like this one – record your results. This will help narrow down the problem significantly. Otherwise it’s just guessing. Hey. I’m having a similar problem with one of my platies and I have a test kit and everything looks fine. There’s is an algea bloom that showed up yesterday that I don’t know what to do about either. It’s possibly swim bladder disease then. The algae likely isn’t connected. Dear sir I am from Rajiv Gandhi University, Arunachal Pradesh, India and I am working on some of the hill stream fish in captivity, so as I am new to it the fish are acclimatize ,and maintained but as the winter season came the fish started dieing and my observation on special fish Botia rostrata found to be dying out due to diseases so how to maintain them. As stated in this article, the most common cause of diseases is stress. Unfortunately, you have not given me nearly enough information here to pinpoint what could be wrong. Do you have a heater to combat the temperature changes within the tank? This is Iftekhar from Toronto. I took a project for growing aquarium fish at indoor. My target is buy small fish from whole seller, grow it up , and then sell to local Aquarium store. This is a small scale commercial venture . I have a 70 Gal. tank with Fluval FX4. But, I made a additional biofilter which is a mini scale of real big biofilter ( using EPS microbead as biomedia which has a large surface area to colonize large number of nitrifying bacteria). From tank, water first come to fluval FX4, then goes to my mini biofilter, then back to the fish tank. 2 weeks back, I bought 180 goldfish ( each 7 gm.) . It was a new tank .After 4 days .. fish started dying .. now after two weeks, only 40 survived . I know it is due to ammonia spike. I am doing water changing 25% everyday . I use “prime” for de-chlonition of water. Also added bacteria. Now ammonia is 1.5ppm , nitrite is 1ppm . I think some nitrifying bacteria already developed in my filtration system. But still 2/3 fishes are dying everyday. I am a bit frustrated.. I am using a fine polishing pad in my FX4. My question is, is this fine filter pad can block nitrifying bacteria flow to my biofilter. Is this the reason for getting delayed for developing bacterial colony in my biofilter? Is it possible to block the flow of nitrifying bacteria by the fine polishing pad in FX4? Unfortunately, no matter how good your biofilter is, 180 goldfish is way too many for a 70 gallon. Even once your tank has cycled, there will be deaths. Cycles are slow and it’s not the fine polishing filter pad that is causing the cycle to go slow. It’s just how the cycle works. I have never seen a fish-in cycle done with 180 fish before. Unfortunately, I cannot advise you on how to make a 70 gallon safe for 180 goldfish. It’s impossible and there will always be more deaths. Thank you so much for your comments and advice. So what I understand from your comments, that, even fine polishing filter pad does not have any effect on colonize and growing up of nitrifying bacterias in bio-medias inside the bio-filter. I am sharing my another recent experience in last October. I stocked 18 Tilapia fishes in 150 liter water( 40 gallon) . Average fish size was 32gm each and total 18 fish weight was 575 gm at the time of stocking. 2 fishes died during grow out time, All other 16 fishes survived well. After 50 days , I harvested all 16 fishes and Total weight was 1760gm ( 1.76kg) . The min. size of the fish was 75gm, and 8 fishes were above 200gm. So they gained 1186 gms in 50 days. We fed them only 950 gm. in 50 days growing period. FCR is even less than 1. Feed was 30% protein with 5% fat which is a regular tilapia feed. The same biofilter ( which is now using for my goldfish) was used to grow up those 16 Tilapia. It took about 28 days to get the ammonia level at zero. I did not use any good mechanical filter for the Tilapia. Only one home made sponge/felt filter was used for removal of solid waste along with my bio-filter. Regular aeration in tank was there. However, After harvesting, I gave all 16 good and healthy Tilapia fishes to one of my friend. I did the experiment just to see the efficiency of my bio-filter. Based on that experiment , I started the 2nd experiment with 180 small gold fish. What I understand, Ammonia tolerance is not same for Goldfish as I have seen in Tilapia. As of today, after 18 days of stocking, 35 goldfish surviving , Ammonia is about 1 ppm and nitrite is 2 , nitrate is 20-30 . Means that bacteria started working. But those fishes already stressed by high ammonia ( like 8 at the beginning) , they will not survive anyway. I have decided now to wait for complete the cycle and then stock again with very cheap feeder goldfish. Lets see. Beneficial bacteria will certainly live in your polishing pad, but your polishing pad will soon clog and need to be disposed of. Ceramic rings or other biomedia are more suitable. But in regards to the polishing pad actually affecting the speed of the cycle? No it won’t have any effect. 18 Tilipia to 40 gallons is a much better ratio, but even then, as they grow, it’s likely you would have seen more deaths if you continued. It’s a completely different story for your goldfish. You put way too many in the tank. In a 60 gallon tank, three goldfish can be over crowding – they have a high bioload. You adding that many goldfish was a death sentence, there was never a chance that they would survive unfortunately. Even once your new cycle completes, if you add that many fish, they will very likely die again. Regardless, I wish you the best of luck in your experiment. Infact, We are in a business of integrating and supplying complete Indoor RAS aquaculture systems in Asia. We have supplied more than 10 projects in India . Each project’s water volume is 180,000 liter ( 47,000 gal.) . Our systems are using for indoor commercial culture of Tilapia, Catfish and Carp. The system has 30,000 liter tank x 6 tanks. The average stocking density is about 40-45kg of fish( at the time of harvest) per cubic meter ( 1000 liter) of water. Our system includes 80 micron drum filter and and big bio-filter with CO2 stripping system. The bio-filter can handle max. 55 kg of feed per day( it can remove the 95% ammonia generated from 55kg of dry feed everyday). This system replace 10% of its total water everyday with fresh water. This water replenishing system keeps Nitrate value in safe range. Recently one of our customer in India started growing ornamental fish in his RAS system in commercial basis. He stocks 3gm size 6 types of baby gold fish 20,000 pcs. in a 30,000 liter tank ( 2 fishes for every 3 liter of water) . Grow them up to 12 -15 gm in 65 days and sell it to market. Mortality rate is like 5%. This RAS project runs completely bio-secured environment. This is the 1st. indoor project in India that is growing ornamental fish commercially. They already done 2 complete batch. The biofilter I made for my Tilapia and Goldfish project, is actually a true small scale model of the big Bio-filter. I am encouraged by the recent success of the Indian project. My thought was to start a small scale indoor system in Canada for growing up and sell Aquarium fish with maintaining water parameters perfectly. So far this a R&D project. It could be a small earning business if it is successful. I think it’s going to be difficult to compare small end-tanks where the focus is on giving a quality of life to a commercial fish cultivating project where the goal is to keep cost and death to a minimum. I’d be very curious to know the life expectancy of a goldfish grown in such an environment as your customer. Mortality rate is not necessarily a good indicator of health. I would love to kept up to date on this project. Aquaculture is fascinating, especially if you can get mortality down to 5% or less. All the best, Iftekhar, I wish you much success in your project. 7.0 ph, nitrate10ppm, nitrite 0ppm, ammonia 0. Tank is 3 months old. Are you using enough dechlorinator? Is there enough oxygen in the tank? Are the fish that dye showing signs of disease? Does your water source contain pesticides? Is there something in your tank leaching chemicals? In mysterious cases like this, I first recommend showing an expert, say your local independent fish store, your tank set up and discussing it with them. Failing that, I’d strip your tank right back so that it only contains the very basics (filter, heater, light, substrate, water) and see if your fish last more than a week then. If they are still dying, this will narrow down the cause to the few remaining few things in the tank, making the problem easier to identify. If this solves the problem, then something you removed from your tank could be the cause of the deaths. There is enough O2 I have 2 big airaters, temp is consistent , the tank has been up for a year, and there have been casualties all along the way! We started with piranas we had 10 all died after about 6 months, then we started with community fish, tetras, cat fish, angels etc however there are 3 of the original community fish still alive, they are the soul survivors! They eat and always look happy, and we have gone through 100 fish since then! Can I have too much flitration? I have 2 FX6 filters rates for 600 gallons each? When we started the tank we used a gravel that had quick start “pre cycled” It was called! Could that be an issue? Can I send you a pict of the tank? Troubleshooting problems like this is generally trial and error until you narrow it down. In fish keeping there are about a million things that could go wrong, so it’s quite difficult to help people that don’t have a similar setup. The reason I suggested speaking with local fish keepers is that they will use the same water source and products as you, which can further narrow down problems. Same goes for stripping back the tank. Same goes for taking out everything unnecessary. It certainly is excessive filtration. Also, those 2 air stones are only going to add to the water movement. I know the saying is “you can never have too much filtration” but this doesn’t take into account the current. If fish are having trouble swimming due to water movement, this could certainly stress them to the point of death. Really, you only need a single Fluval FX6 on a tank this size. However, you could try lowering the flow on both and removing the air stones – your filter outlet should be providing enough surface agitation to maximize oxygenation that the air stones are unnecessary. On your pre-cycled gravel, was it purchased in a bag dry? Generally you would add gravel from an existing tank that is wet. It would do no harm removing your gravel too, especially since your filters will contain more than enough beneficial bacteria for a tank this size. And this makes For a much calmer tank, I can’t believe how much the air stones @100% disturbed the water! So I’m 11 days with no dead fish! And they seem much less stressed. Thanks for your input, you saved the lives of many fish! Thanks so much for the update. I’m happy to hear that this one was an easy fix that didn’t require taking things out of your tank, piece by piece, because the airstones probably would have been one of the last things to go. All the best with your fish keeping endeavours! Hi there, hoping you can help me! My fiance’ and I have been aquarium lovers for many years, all starting in COllege with my first betta, Dexter, who lived a long healthy life full of trauma. I have made a lot of mistakes in my journey of owning fish, but am determined to get it right! I currently have a 55g freshwater tank. it has been running for several months. In the last week(ish) we have lost a female betta, a lyretail molly, and a guppy. I have another lyretail with a greenish spot on his head that looks like algae? I’m confident that I’m doing something wrong, but am struggling to determine what that might be. I did a test strip in our water and everything looked normal. The tank is due for a water change but i believe there is something larger at play in our tank. Any ideas or advice would be greatly appreciated. Frustrated by the lack of resources for fish owners looking to take better care of their fish. The staff at our local pet store have been incredibly helpful, but they don’t know everything either. A few months ago I took a fish in, because I wasn’t sure what was wrong and they had no idea either. If you or your readers have any favorite resources to share i would be so grateful. That’s awesome to hear that you are looking to improve your fish keeping skills, it’s a tricky hobby, especially when many big box chain pet stores don’t train their staff correctly. There is unfortunately a lot of misinformation floating around. I’d start at the beginning with a test. I recommend using an aquarium test kit over test strips, It’s not uncommon for test strips to incorrect results, especially those combo ones that test multiple parameters at once. I personally suggest buying an API master test kit (freshwater), this will test all the basic parameters that usually cause problems – it’s what I recommend for beginners and experts alike, in terms of affordability, no other kit comes close. Just make sure you follow the instructions and compare the colors outside, in bright daylight. About 90% of the time, problems with die offs come down to water parameters, so this will eliminate most of the problems you are dealing with. You’ll also want to confirm your water temperature and water change schedule. Water changes don’t just remove nitrates but also replenish essential minerals. Typically a water change is done every 1 – 2 weeks along with gravel vaccing the substrate. Whether angel fish and platy are compatible entirely depends on the size of your tank. I have seen plenty of tanks with them mixed and no issues. I would assume if the tank is too small, you could have problems. Unfortunately, you have not given me enough direction to identify why your fish are dying. It could be poor water parameters (ammonia, nitrite, nitrate) the tank is too small, lack of cleaning, or any number of the causes mentioned in this article. Hi Ian, I just found your blog. I have a few questions, trying not to go into too much history. Basically I have a small 7 gallon tank, and the pattern is that I’ll have fish that seem really happy for months on end, and then suddenly I’ll have a die-out, although pH and ammonia levels are within healthy range. I gave up and totally dumped and recycled my tank after my first major die-out (which I think may have been due to adding a diseased fish.) Recently, I added new fish this summer (2 small goldfish). Admittedly, I should have waited longer for the tank to cycle and fishies 1&2 died. Then, once I’d established better water conditions, I added two more goldfish. I figured, they’re hardy, I’ll have better luck. So they’ve seemed really happy over the last few months. I added a couple of snails and a banana root plant. Everyone was happy, it seemed. A couple weeks ago the larger goldfish got lethargic and died. After it died the smaller goldfish started acting really weird, but still seemed physically healthy. It literally ate all of the stems of the banana plant (which it had never eaten before). But other than the weird behavior, it was energetic and seemingly fine until today I came home and bam! It’s dead. No signs of illness, lethargy, or anything. Now, granted, this little guy was literally a $.39cent feeder fish I took a chance on, but it’s weird that one day he seemed fine and now he’s gone. Again, the pH and ammonia are fine and the temperature has been consistent. I did add a couple more snails last week, and I’m wondering if they brought disease? Do I have too many snails? I like to keep them as algae eaters because I’ve been told a 7 gallon is too small for a pleco or other algae eaters. I can’t really get a bigger tank right now. I have been able to keep most of my fish for at least 4-6 months before disaster, some as long as a year, so it’s not like they all die instantly. The longest I’ve kept any fish was a female Betta I had for over a year, so I’m really not as negligent as it might sound. I’m really trying and I don’t understand why a seemingly healthy tank suddently turns into a graveyard, even when all the typical stress factors; pH, ammonia, temperature, are seemingly normal. Any advice is appreciated. Thanks! I’m terribly sorry to hear about your bad experience. Please don’t let it put you off the hobby. A couple of problems stand out to me. All of these could have been a problem, or none of them, it’s really hard to tell without seeing a tank in person. 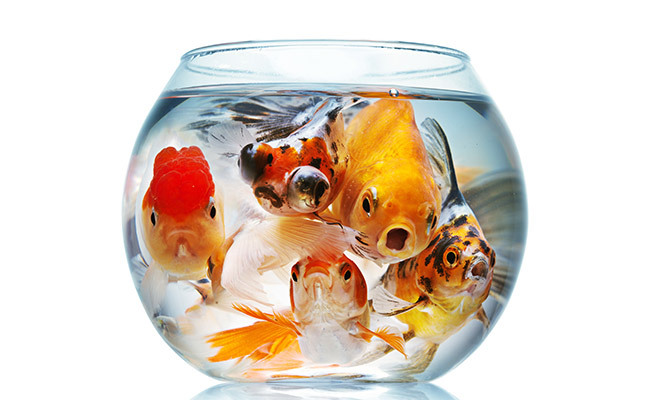 – A 7 gallon is too small for the majority of fish, especially goldfish. There are not a whole lot of fish that you can actually keep in a 7 gallon, so read up before making your next additions. A tank this size isn’t suitable for much more than a few guppies or endlers. – Feeder fish are kept in unhealthy,cramped conditioned and typically have a short life expectancy, It’s not exactly surprising that it soon passed. I would also recommend speaking to someone in your local area who has been successful in keeping fish alive. Since they are using the same water source and similar equipment, they will be in a much better position to give advice. Failing that, is there a local aquarium club or reputable independent fish store you can got to for advice? I have been working with my local petstore to set up my tank. I have tried 3 times adding fish after they say my water tested perfect. They have died everytime within 24 hours. I am doing an African Cichlid tank. I have shells in my tank and the petstore “experts” say they love shells. Should I take them out and empty the tank and replace filter cartridges and cycle the water for a few weeks? Then add the fish without the shells? I love your blog by the way. You can test the water yourself using an aquarium test kit like this one. You should have one on hand anyway, so that you can regularly check your water to make sure nothing has gone wrong. Testing your water will also provide clues as to whether or not you should keep the shells. There shouldn’t be a need to replace the filter cartridges. I’d add some fish food to your tank and wait a few days. If it tests positive for ammonia, your tank isn’t cycled and you should perform a fishless cycle before attempting to add fish again. Can you give me any advise please! It sounds to me like you have not allowed your aquarium to cycle. If you add fish immediately to an uncycled tank, without the proper precautions, there is a very high possibility they will die. Also, the fact that you refer to Nitrate and Nitrite as being perfect has me worried. What are the actual readings when you perform a test? Hi theres something killing my fish but we carnt figure out why . We just carnt figure out why they are dieing . There really isn’t enough info to go off here. It could be disease, lack of oxygen, chemicals in the water, etc. You’ll have to keep investigating. Why not take a photo of your setup and ask your local fish store? They can be an incredible source of help and is why I recommend finding yourself a good one. So how do you put bacteria back in the water? Check out our guide to cycling your aquarium – it takes you through each step of the process. Love your blog, well written and extremely helpful, thanks! Comments like these drive as to keep making more awesome content!